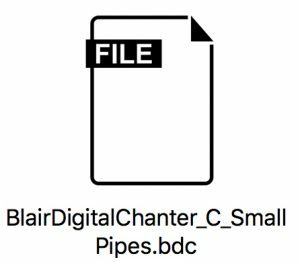 Blair Digital Chanter | Software, sounds, free download. required to install extra features and instruments into your digital chanter. First you need the Blair Digital Bagpipes PC app. 2. Then, you also need a firmware file and instrument file prefixed ‘.bdc’ file to load into your chanter. In this case it is firmware V1.08 and ‘C’ Smallpipes. Read on below for detailed instructions. 1. Blair Digital Bagpipes app, available for both Mac <(CLICK Mac to download) and Windows (CLICK Windows to download) which connects your chanter to a PC. 2. A ‘.bdc’ file. This file is loaded into the Digital Chanter and contains all the new sounds and features. Here’s a link. 2. Download the ‘.bdc’ file, which contains the Key of C Scottish Smallpipes. This file will also contain the latest firmware. 3. Launch the PC app, connect your chanter and select ‘update’. 4. On the PC app, select connect chanter, select update file – and locate the .bdc file. That’s it! Your Chanter is updated to Software 1.08, disconnect and play. Included in the first expansion. • Key of ‘C’ Scottish Smallpipes, complete with Bass, Baritone and Tenor drone. These pipes are pitched at 440hz, rich sounding and genuine bagpipe sounds. Once loaded into your Digital Chanter will appear in the manu as Instrument ‘Usr’. Read below about the additional features. Each instrument now includes a Pan function to enhance use of the stereo output. This is a powerful function that will widen your bagpipe sound and create great depth. All elements of the Highland Bagpipe (Chanter, Bass Drone, Tenor Drone) can be individually positioned in the stereo mix. This will widen the stereo image, and accurately emulate the sound of the acoustic instrument and how it ‘fills the room’. The Pan function can be also used to send individual sound elements to either stereo channel which is useful for studio recording and live performance. For example: Pan the Chanter to the Right side (10R), and Bass & Tenor Drones to the left side (10L). This separates both sounds in the mix whereby the Chanter can be routed to a Reverb, and the Drones to a Chorus, or individually tracked when recording. The Metronome comprises 2 percussive sounds, and multipe beat patterns. Now when the chanter is Shutdown and the Metronome is activated, when powering on the Chanter the metronome will sound with the previous session settings. Pan has also been added to the Metronome. The battery icon will intermittently flash when the charge is at 30%. When fully charged, the icon will remain solid. ‘.bdc’ file which contains the new features and Instrument. Load the app, connect your chanter and install the ‘.bdc’ file to add new sounds. 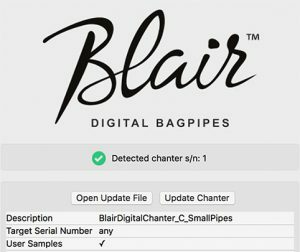 The Blair Digital Chanter lets you play the world-class sound of a Highland Bagpipe, Scottish Smallpipe, or Practice Chanter anywhere, anytime. Featuring an OLED display, smart control button and actual finger holes, turn everyday piping into an extraordinary playing experience.